Light Detecting and Ranging (LiDAR) is remotely-sensed data collected by small aircraft equipped with high-tech laser scanners. Laser pulses aimed at the surface are reflected back to a data collector in the plane, and used to create a Digital Elevation Model, or DEM. This data is particularly useful in densely vegetated areas (such as Newberry), because the vegetation can be removed from the final imagery to get a clear view of the true surface of an area. LiDAR data for Newberry Volcano was collected in 2010 by the Oregon Department of Geology and Mineral Industries. 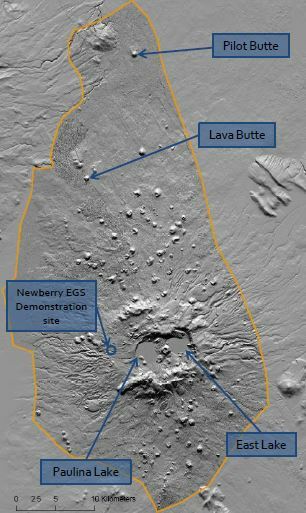 At Newberry, we’ve u sed LiDAR data to better understand the geologic structure and the eruptive history of the volcano. LiDAR data has been particularly useful in mapping the fault system, lava flows and cinder cones (buttes) at Newberry Volcano. Understanding the structural geology and volcanic history of an area is useful in determining the best locations for potential geothermal development. This LiDAR-based image is a DEM of Lava Butte, part of the Newberry National Volcanic Monument and the site of some of the youngest lava flows produced by the volcano. Some of you might have driven up the road that spirals to the top of Lava Butte and seen the surrounding lava flows before. These flows are about 7,000 years old, and originate from the southern side of Lava Butte. Here’s another LiDAR-based DEM image showing most of the Newberry Volcano edifice, including East and Paulina lakes. The orange line shows the area with LiDAR coverage. The surrounding background area is mapped from 10 m DEM data, which is less detailed. Pilot Butte, Lava Butte and Aubrey Butte are all easy to find. These buttes, or cinder cones, are unique geologic features at Newberry. While many volcanoes produce them, very few create as many as Newberry Volcano has. How many buttes can you count? Our last tally came to 451. I’d like to do a tally… where can I get the data? The LiDAR data at Newberry was collected by the Oregon Department of Geology and Mineral Industries (DOGAMI), and can be viewed from their LiDAR viewing website without the specialized mapping software we used to make the maps in this post. 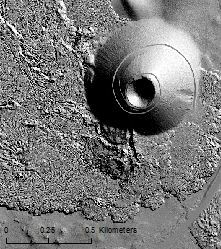 Here’s a link to the DOGAMI LiDAR Data Viewer website: http://www.oregongeology.org/sub/lidardataviewer/ . In addition, we just added another map to our post with higher resolution. If you click on it, you’ll be able to zoom in and have a closer look at Newberry. Please take a look at the following link to Aerotec’s new ebook providing many illustrations of the uses of LIDAR. You can find us on Twitter as NewberryEGS. Thanks for following!